Primary school students throughout the Territory will have a full day of lessons when the new school year begins on November 6. Based on the number of students already registered at primary schools for the new academic year, students in grades K through 6 will begin their academic year at schools that have been deemed usual across the Territory at 8:40 a.m. and ending at 3:30 p.m.
Students from the Althea Scatliffe Primary School, Enid Scatliffe Pre-Primary School, Enis Adams Primary School and Eslyn Henley Richiez Learning Centre in Road Town will be housed at the Althea Scatliffe Primary School. The Seventh Day Adventist Youth Centre in Carrot Bay will house students from the western end of the island- inclusive of the Leonora Delville Primary, Isabella Morris Primary and Ivan Dawson Primary. 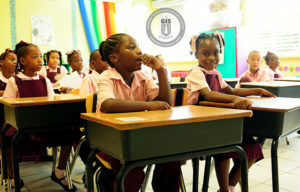 The Alexandrina Maduro, Joyce Samuel, Ebenezer Thomas, Francis Lettsome and the Willard Wheatley Primary Schools have all been deemed usual and students will attend school in their facilities. Through a donation of a 4,000 square feet structure from the Florida Cruise Line, the Bregado Flax Educational Centre-Primary students on Virgin Gorda will be able to have a separate learning area from the secondary students. The structure will be placed in the vicinity of the existing school and the secondary students will be housed in the now primary section. The Jost Van Dyke School was able to salvage an area of the primary school and commenced its school year for primary students, pre-school students and day-care goers on October 16, as planned.